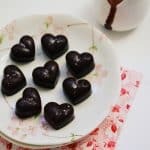 Let me help you wow your loved one with some Chocolate Raspberry Truffles. We don’t really do St Valentine’s Day around here. My husband, although very sweet and romantic in his own way, does not like to be told what to do. So, inevitably, being told to do something romantic on a certain day of the year was not going to work for him. Instead, he likes to surprise me at some other random time (usually a week later). His favourite chocolate treat in Australia is this weird chocolate and raspberry liquorice thing which I haven’t been able to find in the US. So, this year, in an attempt to step up and do something nice for Valentines Day, I thought I would make him a chocolate raspberry truffle. Normally, I don’t like the combination of chocolate and fruit flavours, but this truffle turned out to be amazing. It actually exceeded my own expectations! Plus it’s healthier than anything you will find in the store. Now, these little chocolate raspberry truffles are pretty rich, so you probably wouldn’t want to be eating a whole batch at once. So, just like a normal truffle, you have to savour them. I used avocado for the creaminess – if you haven’t used avocado in baking yet, get on it! Don’t screw up your nose – it tastes amazing and not avocadoey at all – I promise! There’s no refined sugar in here and the vibrant red coating is courtesy of freeze-dried raspberries, which adds a beautiful tartness, and means we are completely dye free – yay! They seriously take like 5 minutes to put together but taste like you put in a fair bit of effort. Whip them up for your love and neither of you will be disappointed. Plus, they will think you spent ages working on them, and that’s romantic, right? Although I used a mixture of berries for this batch - I have tried straight up strawberries and raspberries as well and they tasted fantastic. 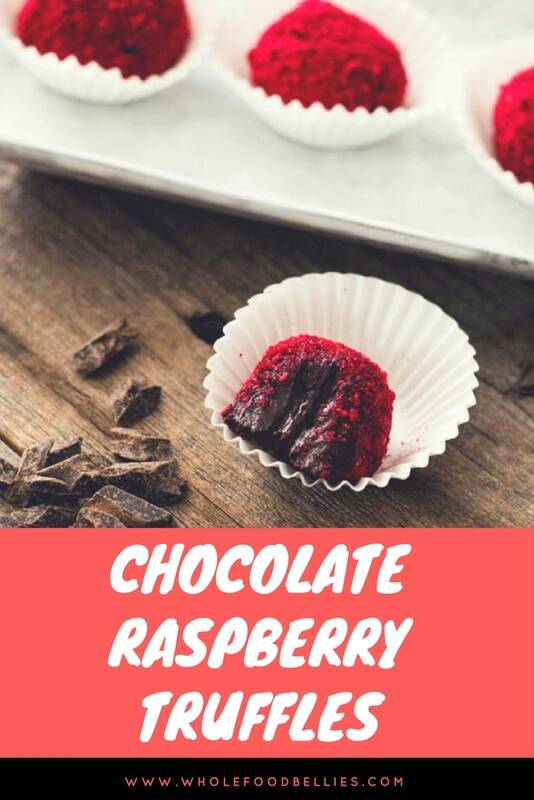 Let me know if you try out my chocolate raspberry truffles, and what you thought! Leave a comment, like on Facebook or pin to pinterest for another special occasion. These look super, but I am wondering how they hold up at room temperature, like on a buffet table? I worry they may get too soft? Many truffle recipes include corn syrup, which I prefer not to use, but does allow the mixture to firm up with cooking. Interested in comments from Whole Food Bellies and anyone else who has made them. Thanks! Hi Beth, they would get soft if left out for too long. I have served them up at a party before and they did well at average temps for about 2 hours. I find serving them on a plate that has been in the freezer helps them hold up for a bit longer. Good luck! Looks great, Donna! How long will they last (theoretically, I know 😉)? Thinking of timing if making them and giving them away as presents…. oh, and when are you coming home next?? We miss you! Ha theoretically not long, as long as you keep them refrigerated they will last up to a week in the fridge. I wouldn’t leave them any longer than that given the avocado in there though. Oh and coming home….that is the question of the hour!!! The color makes it stand out and a great idea for clean eating recipes! The color turned out amazing!! This is an awesome recipe and the finished product itself looks pretty darn delish! I have to try these little gems, my mouth is watering! Thanks for the edible Christmas gifts suggestions!! BTW, these truffles look amazing!!! Using an avocado…wow! Looks delicious and beautiful. Thanks Bethany 🙂 The avocado adds so much creaminess!! Yummm!! I love chocolate and raspberry together! 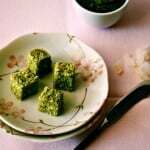 These look so tasty–the recipe is so surprising to me, too. Thanks! Yeah my husband was a bit dubious when he noticed what ingredients I was using – but they worked out great and he ate them all 🙂 So that can only be a good thing! these sound so good I have to try them! I hope you do Claire 🙂 Thanks for popping by! stop it right now these look AMAZING. I will be adding every ingredient to my grocery list and making it this weekend. Oh Yummmmmmm! Going to have to make these. Thanks so much for sharing! Oh go on then 😉 We had a chocolate and raspberry wedding cake and I’ve been fond of it ever since! We had a chocolate and raspberry wedding cake too 🙂 Sooo good!! These look super tasty and so easy to make! Great ingredients! These sound so tasty, and so easy to make! Great ingredients! Ahh you have the best recipes! Must try these!